Tips for Ankle Fracture Treatment. If you twist your ankle badly and cannot walk on it due to pain, seek medical help. Treat all acute injuries with the RICE (Rest, Ice, Compression, Elevation) principles of acute injury management. Normal healing time of most bone fractures ranges from 6 to 8 weeks in a healthy adult. Rehabilitation for the ankle can begin immediately. Strengthen the core and other lower extremity muscles. Seek the advice of a Physical Therapist who treats orthopaedic injuries to learn the proper exercises to perform. Broken ankles can happen almost anywhere, anytime. A fracture might occur if you are in an accident, if you trip and fall, and even if you twist or roll your ankle. Thank goodness not all fractures require surgery! If surgery is required, rehabilitation will take time in order to restore normal and total movement to the ankle. Ankle fractures commonly occur when the foot and ankle are violently inverted and too much force is placed through the distal end of the fibula. When the force surpasses the strength of the bone, the bone will break. A complete fracture means that the bone is broken in two or more pieces. In the past, recovering from broken ankles involved wearing a cast until the bone was completely healed: usually 8 or more weeks. That long period of inactivity created other problems such as significant restrictions in joint motion, soft tissue contractures, severe muscle atrophy, osteopenia (softening of bone) of other bones in the involved area and changes in the hyaline (articular) cartilage. These changes extended the time involved to fully rehabilitate the involved body part. In recent years, doctors have begun performing an Open Reduction Internal Fixation (ORIF) with the goal of having patients start rehabilitation within 3 to 4 weeks. 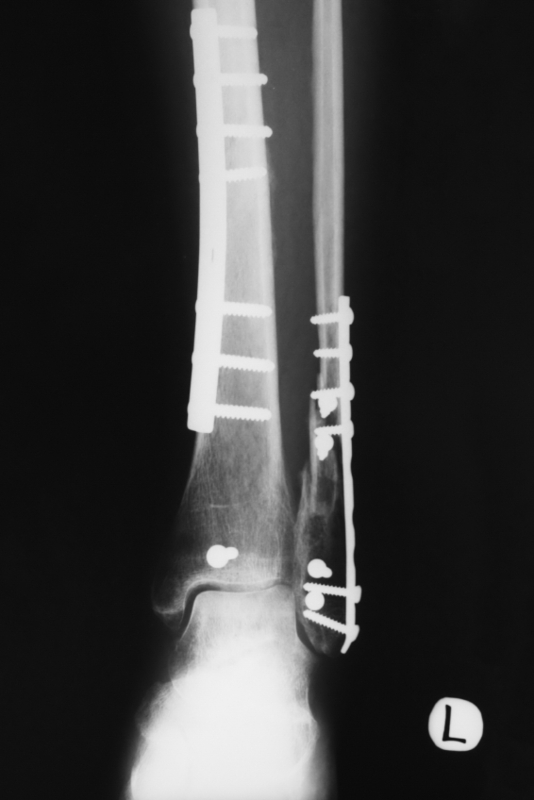 The ORIF procedure involves re-aligning the pieces of the bone and “fixating” them with metal plates and screws. ORIF surgeries require a period of immobility in most cases. Physicians utilize fixation materials that enable patients to begin moving the involved area or bearing weight on the involved limb in several weeks compared to several months. Within 3 to 4 weeks patients are usually starting a formal rehabilitation program. During rehabilitation, patients are limited in action and activities, but Physical Therapist have the ability to remove the protective splinting/bracing, performing manual techniques and prescribing appropriate exercises that will enhance motion and reduce the swelling and pain in the area. Early controlled motion has proven to reduce the total time of the rehabilitation process. Pain: Everyone has a different pain tolerance. The surgical procedure will normally lead to extensive swelling and pain. Many surgeons will wait several days to put the cast on the involved ankle which makes it easier for the patient to utilize the RICE principles (Rest, Ice, Compression and Elevation) to control the swelling and pain. In most cases, a posterior splint will be worn for the first couple of days and then a permanent cast will be put on the involved ankle for several weeks. Weight bearing: For the first several weeks (3-6), patients can expect to use crutches or a walker. The surgeon will take X-rays several weeks after surgery to determine how long a patient must remain non-weight. 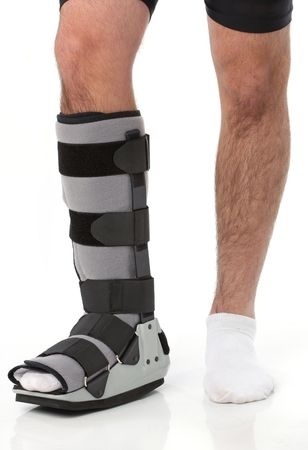 If the bone shows enough signs of healing, you will be given the ok to become partial weight bearing and the permanent cast will be removed in favor of a removable protective boot. As you progress through the rehabilitation process, you will be given the ok to place more body weight on your involved leg. Based on X-ray studies at future doctor’s visits, you will eventually be told to transition to full weight bearing which usually occurs around the 6-8th week after surgery. Braces: Your surgeon will determine what kind of protective brace that you will have to wear throughout the different phases of the healing/rehabilitation process. Initially, the surgeon requires a period of immobility for several weeks. This entails wearing a cast for that period of time. As the patient progresses through the post-op period, the protective bracing becomes less cumbersome and allows for more motion and enables you to begin a formal Physical Therapy program. In most cases the patient will be required to wear a form of protective bracing for 2-3 months. When you return to high-level activity, you might be asked to wear a brace that will aid in supporting the involved ankle and help avoid reinjuring the ankle. The braces help support the ankle throughout the rehabilitation process until the muscles are strong enough to provide dynamic support to the joint. Sleep: Sleeping can be difficult. Getting comfortable with the cast or brace can be challenging. Your Physical Therapist can help you with some strategies that might help. Work: The return to work is dependent of the physical demands of the patient’s job. Most patients can return to some form of limited duty work within a week or two following the surgical procedure. If your job entails standing or walking you might not be able to return for several weeks. Ask your doctor and Physical Therapist to get an idea how long you will not be able to perform your type of work. You will have to wear a brace of some sort for several months, therefore ensure that your employer allows you to perform your job duties while wearing a brace. Having fun: Recreational sports, hobbies, “work outs”, house chores and other activities will have to be placed on hold until the bones have healed sufficiently to allow you to perform the motions associated with your activity. This can range from a couple of weeks to several months. Moderate level activities that require running, jumping and agility type movements will begin approximately 2-3 months after the surgery. High impact activities and aggressive agility type movements might be put “on hold” until 4-6 months post-op and your surgeon might require that you wear a protective brace. The patient will begin a formal Physical Therapy program when the cast is removed and the patient is placed in a protective “boot.” Prior to that, the patient can perform core and upper extremity exercises. The goal of formal therapy is to regain normal, pain-free motion in all planes and re-establish strength and normal neuro-muscular activity throughout the involved leg. Some weight-bearing forces through the healing bone will stimulate more bone production and healing. The Physical Therapist can teach the patient proper activities and exercises that will aid in the return of their “normal” ankle function.